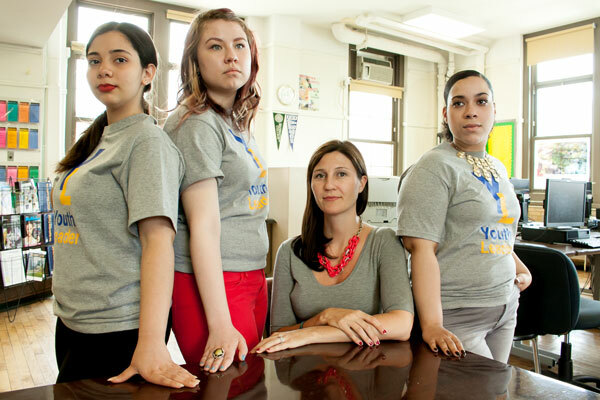 at the High School of Fashion Industries in Manhattan, college readiness is not only the focus of Kate McKeon, seated, the college counselor, but also Youth Leaders (standing, from left to right) Alondra Rivera, Gabriella Ramalho and Maria Santana. Four young women, heads bobbing up and down, are leaning over their desks in Jeff Newman’s 11th grade social studies class at Fashion Industries High School in Manhattan in late March. But instead of peering at historical documents, trying to figure out what were the precipitating causes of the Civil War, they are perusing statistics on three colleges and comparing them according to a list of criteria ranging from total enrollment to percentage of applicants admitted, diversity, tuition, top majors and percentage of students who graduate in six years. Fashion Industries is one of many high schools grappling with how to prepare all of their students not only to get accepted into a college but how to navigate the post-secondary world and graduate. The Bloomberg administration established a “college readiness” metric on its school Progress Reports in 2011 after noticing that, despite rising graduation rates, over 70 percent of New York City high-school students who went on to CUNY had to take remedial classes before they could begin their regular college classes. But college readiness is about more than pure academics. The complex college search process to find a college that is the best fit, the quest for financial aid and preparation for the independence and lack of rigid structure that characterizes college life are a challenge for all students, but especially those whose parents didn’t attend college, are immigrants or have few resources. Low-income kids, who are often the first in the family to go to college, may not even have known anyone who has graduated from college. Because so many of New York City’s students are first-generation college students, high schools have to shoulder the responsibility of raising questions that might be part of normal dinner conversation in middle-class homes. Why go to college? What are the options for college? Which college is for you? How do you decide? What kind of financial aid can you get? And what do you do when you get there? At a time when everyone from President Obama on down has talked about the importance of post-secondary education, in New York City college guidance varies tremendously from school to school. Stuyvesant High School has four college counselors; Brooklyn Tech has two college counselors and another person assigned specifically to help students on scholarship and financial aid. Bronx High School of Science has 12, expecting all of its guidance counselors to do college counseling. This is not the case at other schools, and particularly at the newer small schools. While small schools were touted during the Bloomberg years as answers to the problems plaguing old-fashioned large high schools, the reduction in size has led to bare-bones staffing. Because a school’s budget is based on the numbers of students it serves, some small schools have one guidance counselor in charge of everything: programming, academic counseling, the special education population—and, perhaps, college guidance. Across the board in New York City, over 50 percent of students have a student-to-guidance counselor ratio of over 250 to 1, according to a 2012 study from former Comptroller John Liu’s office. At the same time, there is increasing need for college guidance and support. While nationwide college-graduation rates have nearly tripled from 1971 to 2013, there is a strikingly different picture when you break out the numbers by family income,. In 2009, while 82.4 percent of 24-year-olds from families with the top income had four-year degrees, only 8.3 percent of 24-year-olds from the bottom family income tier did. In a competitive New York City economy focused on finance, technology, law and the media, it is even more obvious here than in the rest of the country how necessary a college degree is to survive. Since 2011, her office has offered training sessions though Goddard Riverside’s Options Institute that to date have reached over 1,000 high schools staffers. The DOE official (who declined to be named) said 67 percent of high schools have had at least one person go through the six-day training. And she said the office is involved in helping schools select the best non-profits to fit their particular needs. Some high schools—like Fashion Industries and others—have been way ahead in thinking about how to create a college-going culture in their schools. In addition to having a college advisor, they have brought in non-profits to provide an array of other resources. Other high schools have not done so well. As self-critical as the open and serious 17-year-old is, neither of whose parents attended college, he probably should not shoulder all the blame. Jermani’s school, the High School of Civil Rights, one of the four small schools in the old Thomas Jefferson High School building in East New York, has no college point-person. It’s only because of the counselor from the College Success program who works with a caseload of 25 to 35 of the school’s seniors that Jermani is weighing acceptances from 11 to 12 colleges. The principal did not respond to several phone calls and emails to discuss what the high school does provide in terms of college advisement. Cypress Hills Local Development Corporation is one of those 250 community-based organizations that have picked up the slack in many low-income communities, often filling in where schools have failed to provide their students much help in the college decision process. Their Fulton Street storefront office pulls in others who are, for whatever reason, only beginning to consider college. “What are the skills that these guys need? What are we hearing from colleges that they lack?” were the questions at hand, explained Newman. The staff put together a month-by-month plan across all grades on how nitty-gritty writing and research skills were to be taught, culminating with written projects in each of several content areas and formal presentations in each grade. While high schools ratcheting up the rigor of their academics is key, it is only one part of what college prep is. That is why Fashion Industries established the APPS classes for students on every grade level, one of which the principal himself teaches, where students are introduced to the idea of college starting in 9th grade. And Fashion Industries not only has Kate McKeon, a dedicated college advisor, as well as six other guidance counselors who’ve been trained to do college advisement, but it also has eight “Youth Leaders”—juniors and seniors who serve as guides, goads, big brothers and big sisters for their fellow students..
“School is such a big decision for all of us,” says Maria Santana, the daughter of Dominican immigrants, is only the second person in her family to go to college after her older brother and is the student body president as well as a Youth Leader. “Students have jobs, take care of younger brothers and sisters. . . .Filling out applications correctly or on time is not their biggest priority.” Youth Leaders have caseloads of 60 students each and work with them individually on their applications and their financial aid forms and also run workshops and presentations for freshmen and sophomores to get them to start thinking about the college process. The eight Youth Leaders, along with over 60 counterparts in 20 other schools or college-based organizations around the city, are part of Youth Leadership for College Access. It is a program of College Access: Research and Action (CARA), a non-profit which is housed at the CUNY Graduate Center that was started three years ago by Lori Chajet and Janice Bloom, two former high-school teachers who direct the program. “We started to think about college success—how we can help students not only get into college but also flower there,” says Chajet. “Neither of us wanted to just write about it. We wanted to figure out practices to deal with it.” Having worked with high-school students who were the first in their family to go to college—or to even consider college—both understood that college support and guidance is a vital part of what high schools had to offer students. The Youth Leader model is an important part of what they do. “Because they are going through it themselves, they can be the most helpful to other students because they know where they are coming from,” says Chajet. CARA provides the youth leaders with over 16 days of training during the summer and over the year so they become experts in everything from CUNY, SUNY and private college options to educational opportunity programs to financial aid. “What we find is as they learn to counsel other kids at their school about college, they’re taking it out to their sisters, brothers, their housing projects as well,” she says. The College Bound Initiative is a college guidance program of the Young Women’s Leadership Network, a non-profit that runs five all-girls public schools in New York City. It was started in 2001 to help students through the college process. From the Network’s own five schools, it quickly spread to other co-ed public high schools. CBI is now in 21 schools, serving 1,300 to 1,400 seniors. Pemstein, CBI’s college counselor at Central Park East, teaches college prep workshops in junior and senior classes, brings in college representatives and organizes college trips. At Central Park East, like Fashion Industries, discussion of college starts in 9th grade, not junior or senior year. Both use CARA’s 350-page College Inquiry curriculum, which attempts to move discussions about college into classrooms. “Every adult who has a point of contact with our kids is important in terms of discussing college,” says principal Bennett Lieberman. A sudden family catastrophe from a death to illness to eviction, the kinds of things that high-school students from poor families often face, can cause admitted students to change their minds. Sometimes it can be the pressure from the family to get a job rather than going away to school. Sotonye Douglas’ job is to staunch the summer flood. Currently a student at SUNY/Albany, she’s working back at her high school, Kurt Hahn Expeditionary Learning School in East Flatbush, as part of College Bridge, another program of CARA that hires and trains 35 college students to work in their former high schools to supplement the college counselors and to run interference with some of the issues that come up once the students are admitted to college. Douglas, 20, is a college coach extraordinaire. She graduated in 2011 as part of the school’s first graduating class and is majoring in human biology with a minor in art history. On her spring break, she was already following up with her caseload of 50 seniors at her old school. Once she finishes at Albany for the year, she’ll be back at Kurt Hahn working with college applicants again. In March, she sat down with seniors in front of a computer going over a wide Excel sheet, checking off what they had done so far, and still have to do, but more importantly checking in with them on how they—and their families—are feeling about the move to college. One young woman, Brigette, said she had changed her mind about going to York College, where she initially wanted to study social work, to instead enroll in an eight-month program at a for-profit beauty school, costing $17,000. “They say I can apply for scholarships,” she said. Douglas was quiet, warm—and thoughtful. Another young woman, Shaina, had been accepted into SUNY Albany but she and her family were asked to come up with $13,000 in loans. Her mother said she can’t afford it. Albany is Shaina’s dream school. “I’ve cried about it already,” she said. They strategized about how to discuss it with her mother. Sometimes, of course, the counseling doesn’t end up pointing a student toward a traditional college degree. After discussing her case, Brigitte decided to stick with beauty school. In many schools in low-income neighborhoods, the parents often take a low profile in the college process. Only 29 percent of New York City public school parents have a college degree of any kind, according to the American Community Survey. Some work two or three jobs, don’t speak English, are undocumented, feel the financial aid questions are intrusive or because they never had to apply to college, find the process overwhelming and beyond them. At Kurt Hahn, the school made a big effort this year to make parents a part of the college conversation. At the end of March, they held a College Café, a four-hour program of workshops on the college application process, finding the right school and talking about college. About 45 families came—some parents bringing their kids, some students bringing their parents. There were even raffles and door prizes. For Phil Weinberg, the newly appointed Deputy Chancellor for Teaching and Learning under Chancellor Carmen Fariña, the discussion about how to prepare students for higher education is a familiar one. He served as principal of the High School of Telecommunications, a well-regarded high school of 1,300 students in Brooklyn, for 13 years. Telecommunications has two college advisors (who also teach as well), and a college office on the first floor, “which is one of the first things you see when you come in,” he said. Students, starting in 9th grade, are taken on college trips “and we start talking about what happens after high school from the beginning,” he said. LaGuardia High School for Music & Art has produced a list of famous performers and artists. But some alums say the current leadership is emphasizing grades during the admissions process, turning away talented students who didn’t meet the academic mark.